Once again, it's been a while. I promise I've been working on some creative stuff, I'm just not quite ready to share yet... be patient. Anyway, I'm taking to the virtual page again to talk about something that's been on mind for a while. As an artist, I often feel pressured to create something powerful. Something that speaks to major social issues, something that encompasses everything I'm feeling, and everything everyone else is feeling, all processed in this amazing combination of art materials. I feel pressured to create something that the entire world will see and say "ohhhhhhh, so that's what it's all about." I think social media has really increased that pressure - can an image really affect society if it doesn't go viral on Facebook and Twitter? 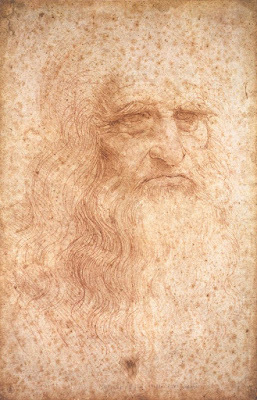 Leonardo da Vinci, presumed self-portrait c.1518. And then we feel obligated to create powerful, world-changing art to show that our advocacy is worth it. I've talked with other artists, and I know I'm not alone in this. It's pretty hard to spend every day talking about how much art matters, and not follow it up with making art that "matters." Actually, I have a feeling that sense of obligation is a big part of artist's block. Not only do I have to tackle coming up with ideas or motivation, I also feel as if I have to try and scale the ginormous mountain of influence, conflicting voices, and hashtags; to reach the top of that mountain and hold up my little painting and let it scream its message for all to hear. For all to hear. And if all do not hear my art's cries, I must have failed. You are not obligated to create viral art. You are not a failure if your work doesn't circulate beyond your closest friends and family. You are not a failure if your art doesn't end racism, abuse, hunger, or the stigma surrounding disability or mental illness... or whatever other causes your heart beats for. That pressure you feel to create something which breaks through the clamor and directly impacts the course of culture and social justice is immaterial and paralyzing, and therefore, should not must not force its way into your creative process. Should we then, as artists, intentionally make art that does not speak to current social issues? No. Please, seek to make art that adds to the dialogue surrounding the social issues that are close to your heart! You're a person in this world. You're not unaffected by social issues. And you're probably not entirely compassion-less, either... Odds are, as a human being, you care about at least one social issue. So make art that speaks about that. Just don't feel as if your work is not valuable and worthwhile simply because it doesn't reach the top of that mountain. Putnam Publishing Group in 1997. I recently read Timequake by Kurt Vonnegut, Jr. He's a brilliant author. One of my favorites. His work is pretty much the definition of creative - absolutely unpredictable, wildly original, and his style and voice are unlike anything else. 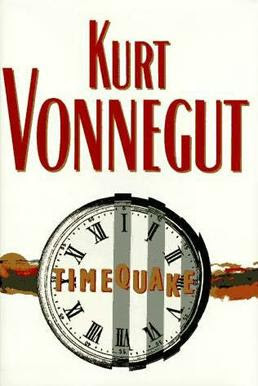 I mean, there's no mistaking a Vonnegut book! This struck me like lightning. When we make art, we must acknowledge our inabilities as much as our abilities. I am one person. I am an artist. Try as I might, my voice is limited. Try as I might, my work circulates about as far as friends-of-friends. Try as I might, my work isn't leading any social dialogues. Yet, I will make my art. And by making it, I think, and making it exactly what it ought to be, my art has value. Do you see it? I can't single-handedly save the world. But if I make a drawing, make it to the best of my ability, pour my voice into it and hold it up from my nook at the foot of the mountain, someone will hear that voice. And forgive my hubris - maybe my art is exactly what that one person needs. In fact, let me take this a step further. Even if no one hears your little voice but you, your work still matters because you will have made it exactly as it ought to be. Exactly as you need it to be. No one can tell you how to make your art, and no one can tell you if it's wrong or right... only you. If it expresses your heart, or challenges you to grow in some way, you've won. I will continue to hold up a picture of Da Vinci and I will continue to use his legacy to vouch for the power of art. But maybe I'll hold up his picture with one hand and my own art with the other... and not pour so much effort into climbing the mountain, but focus on making my art exactly as it ought to be here on my little foothill. Exactly as I need it to be, to change me for the better, and hopefully to empathize with the one or two people around me. Artists, release yourselves from the pressure to the change the world. Don't let the perceived obligation for your art to reach the social mountaintop paralyze you in front of a blank page. If the people around you pass your work up to to the top of that mountain, that's great, and I'll gladly do my part to give your work exposure. But your work has no less value if stays in the foothills. By golly, you made your art exactly as it ought to be! You, my dear Cailey, are a good writer. How glad I am that I read this blog today! How glad I am to hear a young artist making art for the right reason. (And you are spurring me on to get up to my work room and make something as it ought to be.) Thank you!